With the longer days and warm weather approaching look for ways to incorporate outdoor education into your classroom. Below Penny offers some insight into outdoor education, the benefits of it, and how you might want to incorporate it into your classroom, with multiple resources for further investigation. “A quarter of a million children are persistently truant from school, missing at least one day every week. The reasons for disaffection and low attainment in the classroom are undoubtedly complex, but many agree we need to find ways to make learning more engaging. Many children struggling in today’s classrooms are practical learners who respond best to practical experiences, learning by doing. Learning outdoors brings teaching alive. In surveys of schools that improved their grounds with Learning Through Landscapes support, 78% of teachers reported a change in teaching practice, whilst two-thirds observed improved attitudes to learning among their pupils. The site is talking about more than field trips. This approach is nothing short of a transformation of how we teach. A few years back I attended a training by Carla Hannaford who talked about kindergarten forest schools in Scandinavia. Through the whole year–even the winter–groups of tiny learners go into the woods and are left to do what they like, provided they do no harm to themselves or the environment. The experience is led by learners’ interests. The teachers are always near by to monitor activities and answer resource questions. 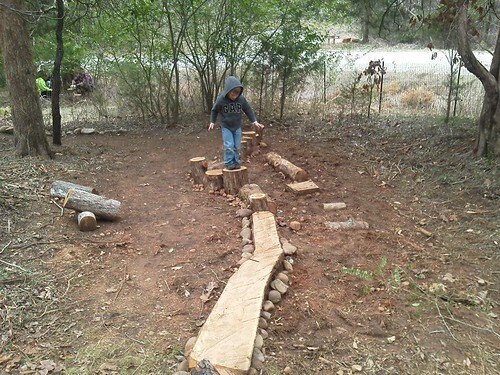 The results have been stunning: children construct bridges, dwellings, play structures, uncover animal tracks and abodes, and create complex living and playground areas using sophisticated math formulas; in effect, they develop their own outdoor science curriculum, demonstrate sophisticated team collaboration, and they remain focused for hours without the need for redirection. They learn critical thinking skills too: some examples are seeing similarities and opposites and varied shapes and functions of found objects; counting real things; classifying, and analyzing problems that emerge naturally. Last, students struggling with failure, despair, and a negative self-image, often brighten up, focus better and are calmer when they can learn while they ‘play’ in an outdoor setting. An article giving the rationale for Canadian forest schools. The Stick Book, The Wild Weather Book, and The Wild City Book by Jo Schofield and Fiona Danks. Smart Moves: Why Learning is Not All In Your Head, by Carla Hannaford.